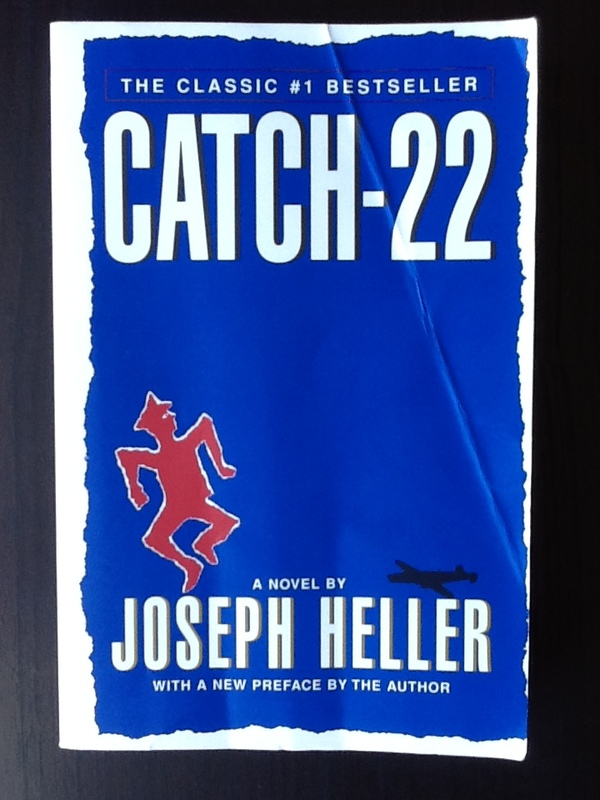 I Didn’t Like Catch-22 – The Bookshelf of Emily J.
I didn’t really like Catch-22 (1961) by Joseph Heller and number 13 on the BBC book list. I’m not saying it isn’t a likeable book or that you shouldn’t read it or that others won’t enjoy it, but I did not. I’m not sure exactly why, because it is funny and well written. But I also found it to be somewhat dirty and boring. I almost didn’t finish it, but when I expressed this to my husband, he reminded me that it was on the BBC book list that I am reading for this blog, so I had to finish. I’m glad I did because it was my third attempt at reading it, and I really did not want to try again. Now it’s done! The main character, if there is one, is Yossarian, a pilot for the United States during WWII, who is stationed in Italy. He does all he can to avoid flying missions, the number of which is always raised before the men can actually go home. He spends most of his time in the hospital, feigning illness and causing problems. His greatest fear is that somebody is trying to kill him, and that’s because they are; he’s at war. Everybody is trying to kill everybody. Hilarity ensues when the whore of his dead friend begins stalking him. She finds him at every turn, since he was the one to break the bad news of death to her, and tries to stab him. It gives a comic and exaggerated life to Yossarian’s paranoia. The idea that somebody is trying to kill him (and everybody at war) is the premise of the book and informs the insanity that abounds, especially among military leaders. Heller uses the situations to poke fun at the military leaders and their logic. The book is a satire of hierarchy, politics, war, and the military. One of the major themes is that of plum tomatoes. They turn out to be a major part of the “plot,” but I’m still not sure what they mean. Does anybody know? 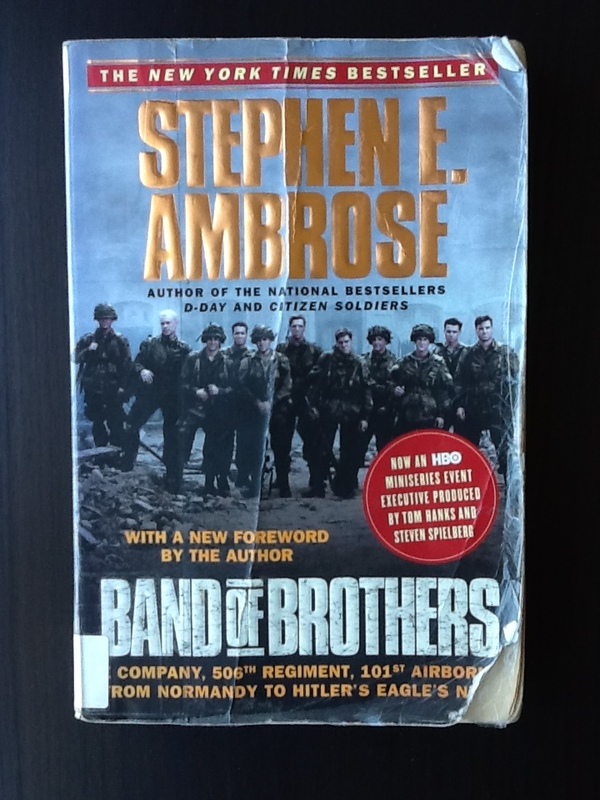 Now, I may not have enjoyed the book because I was watching the HBO series Band of Brothers (starring Damian Lewis!) at the same time. It is about one of the first paratrooper units, Easy Company, to land in France on D-Day. They made their way across Europe, to the Battle of the Bulge, and eventually captured Hitler’s Eagle’s Nest. It is a fascinating tribute to the men who fought in that company, especially Captain Richard Winters. Because of the miniseries, I plan to read the book and Winters’s memoirs. These men were heroic, and the miniseries portrays their sacrifices as important, worthy, moving, and vital. The music and cinematography contributed to this, of course, but patriotism filled me when I watched this series and when I learned of Easy Company’s qualities and experiences, for which I’m grateful. So to then read the satire of Catch-22 and to see some of that downplayed and made fun of just struck me the wrong way. Of course, humor is meant as a way of dealing with that which is too terrible to face. I understand how important that is and how sadness underlies a lot of humor. But I preferred Band of Brothers as an interpretation of WWII rather than Catch-22. There is room for both, but I’m more sentimental and emotional. Thanks for this. I recall attempting to read Catch 22 and have added to my summer list in the hopes of time granting me a better understanding of it. We`ll see. That BBC booklist is useful too. Thanks! You’re welcome. Enjoy the list! my father flew B-24’s in Italy during WWII, and had a very similar sense of humor. I think what Heller captured here might be bigger than what’s on the surface – the way a whole generation dealt with their daily horror. Very good! This gives me some perspective, and you speak the truth. Dealing with horror is usually best done through humor. Thanks! That’s true. I didn’t see a reason to rant because I recognize that it is “good” or likeable. It just didn’t appeal to me, but I know it appeals to lots and lots of people. That is why I’ve tried to read it so many times, because friends kept recommending it! I have made a deliberate effort to read many of the BBC list, but don’t intend on reading them all. I am also doing the booker list as well, but again I choose some not to bother with. I’m not a buddist, so I figure I’m only on this planet once. I’m using it as a guide, figuring if lots of people like it, it must be for ‘some’ reason. I think that because you are writing about it you will get a great sense of achievement when you do complete them all. I see The Count of Monte Christo is still on your list. I loved the book, but it took me a while to get into it so if this is the case for you, stick with it…. I needed to hear that! I’m reading The Count of Monte Cristo right now and parts of it are gripping and other parts are just confusing and wordy and long and I am getting bored with it. I’ll stick with it! have you ever read ‘One Day’ by David Nicholls? Band of Brothers is amazing- one of our favorites. We started rewatching them on June 6-d-day. The Pacific is next on my list! And yes, the title has escaped into popular usage, with good reason. That part of the book is pretty funny and clever as well. It always hurts when someone says they did not like your favourite book! Having loved and enjoyed it for years and encouraged others to try it I know it holds little middle ground; people either love it or just can’t stand it. I find it’s scenes and characters so much more memorable than for a lot of other works and it’s non-linear structure means I can always pick it up off the shelf, turn to a random chapter and just start enjoying it again! It is a little unfair to compare it to Band of Brothers. Despite being set in WWII, it has been misinterpreted as an anti-war novel because of the anti-Vietnam sentiment at the time it was popular and is not strongly based on Heller’s WWII experience. Rather it is mostly an anti-bureaucracy novel and a reaction to McCarthyism. The film isn’t great except to the fans of the novel, but is supremely well cast and worth checking out – with Alan Arkin as Yossarian, Art Garfunkel, Martin Sheen, John Voight, Orson Welles and Bob Newhart as Major Major Major Major. Don’t give up on Heller either. Many critics consider his novel Something Happened to be his best work, especially after Kurt Vonnegut gave a strong review of it (http://www.nytimes.com/books/98/02/15/home/heller-something.html). I only just started reading this for the first time last week so am only 1/4 of the way through, but so far I’m really enjoying it. Like justjase79, I think it may be a bit unfair to compare it to Band of Brothers – they are setting out to achieve different points of view of war entirely. That said, I can see why it is either loved or loathed, and appreciated the measured review you have provided. I myself am not always so kind when I dislike books! As an aside, Band of Brothers is one of my favourite TV series of all time and has been rewatched many times in my house. Unfortunately I didn’t get the same feel from Pacific but it is well worth watching too. It’s a much more difficult story to tell as there is less of a personal link with the characters (we don’t see them training as a group, etc). Let me know what you think when you finish it. I loved the first fourth of it, too. The scenes with Yossarian crossing out important parts of letters and such are hilarious! And thanks for weighing in on The Pacific. I look forward to it. I haven’t read Catch 22 but love Band of Brothers -it’s an incredibly well done series. It’s sister series, Pacific is very good too but a different type of war that makes it feel even more ‘gritty’ and with a greater psychological impact, I think. I really want to see Pacific now! Thanks for telling me more. The plum tomato is actually a red herring (confusing food groups! ): the curate is falsely claimed to have stolen a plum tomato, and the incident serves to show how common sense gets jettisoned because of the lack of perspective and disproportion in the military’s attitudes to life, death and the following of orders. I hope you enjoy the other books on your list. Bye, from lookingglasslanguage.wordpress.com. I understood the whole Catch-22 bit, but thanks for clearing up the plum tomato. Red herring, of course! I, like you Emily, tried to like it but didn’t. I have kept the book though and based on others comments may now try to read it to completion. I don’t see any reason to force yourself to finish it, unless some of these fantastic comments have convinced you. There’s certainly value. I haven’t read catch 22 for many years, but now i must reread it again !!! Fist bump! I’m glad I’m not alone on this. I must say, You didn’t like this book but now you made me want to reread it.. It was so long ago. I wonder if I liked the book? thanks .. without you meaning too this will be added to my books of reread..
Ha! That’s funny. I hope you enjoy it. I really do! Most liberals loved M*A*S*H when it came out. They saw it as an attack on conservatism, militarism, religion, and ‘bourgeois’ values. Today, many liberals and progressives will find it ‘sexist’, ‘racist’, ‘homophobic’, ‘sadistic’, ‘pro-bullying’, ‘insensitive’, and ‘judgmental’. Fashions and times change. When Wasps ruled America, many Jewish novelists and screenwriters attacked everything deemed to be ‘normal’ and ‘mainstream’. Now that Jews and homosexuals rule America, they push politically correct platitudes and sit judgment on everyone who isn’t ‘fully evolved’. That’s interesting. I’m sure that cultural tides and changes affect the way that I view certain books, among other issues. You preferred Band of Brothers because that TV show let you continue believe in a fantasy version of war full of heroes that plays to your patriotic values. It seems Catch-22 may have challenged you to think differently than you have in the past and upset your simplistic ideas about war and its horrors. Catch-22 is a brilliant book but it may not be for prople who prefer the comfort of fantasy and propaganda to reality and horrors and hipocracy of war. I’ve read Catch 22 twice. The first time was as a teen, and I found it to be VERY funny but extremely hard to get through. I loved it, but found reading it to be tiring. The second time I read it was in my late 30s, and I blew through it without any reservations, and came away considering it the best novel I had ever read. This second time, though, I found it to be heartbreakingly sad and angry – something made more pronounced by the bitter humor, which was amusing, but seldom made me laugh. I also found the subject matter – the madness of turning war into a lucrative business – to be incredibly appropriate to modern America. I can understand why some people don’t like this book, but I think it’s absolutely brilliant and even more important than when it was released. I can agree that the themes are brilliant . . . and heartbreaking. Nice observation. I just didn’t like the style. 🙂 Thanks for weighing in. I liked hearing your experiences with the book.